Yay!!! Aparna conferred upon me the Versatile blogger award. It's my first award and am so glad! ETA: While, I had nominated Nancy for the award, I later found that she had simultaneously done the same. Thanks again Nancy! 1. Thank the person who nominated you for the award- done. 4. 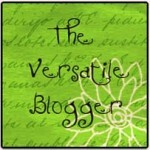 Add the Versatile Blogger Award picture to your Blog Post- done. Radhika- she does not post very frequently but her posts have variety and some good poetry too! Purnima- She has become a proud mother of a beautiful daughter, so I doubt she'll take this tag up in the near future. Yet, she qualifies for the award. Sahana- She is truly a master with words. Her posts will most definitely leave you with a smile. She's already a recipient of this award, but I guess that's ok. I can only come up with these many names! 1. I loath lizards. I am also completely terrified of them. I am brave around roaches and can send them to heavenly abode in a jiffy but when it comes to this sluggish creature, I can turn numb with fear and disgust. We have been fed with some superstition that one should not kill a lizard. Don't ask me why, 'cause I have never got an answer. I am not sure I believe in the superstition but I cannot still muster courage to kill one. So, that leaves me with only two other option: To either co-habit until the monster decides to quit the house or somehow drive it out of the house. Both the options leave me in a state of utter misery till the exit of the cause, so I try to block the chances of its entry in the first place. I have observed a couple of them lurking near the main door, hence each time I open the door, I make a complete and thorough scrutiny of the frame and door to satisfy myself that the dreaded creature is not lurking camouflaged waiting to furtively enter the house. Of course, the dear husband thinks this is just one other side-effects of my mental imbalance. 2. I have a sweet tooth. I crave for a sweet especially after lunch. ANY sweet will do. 3. My face mirrors my thoughts. I cannot behave as though all is hunky-dory if things are not so. Also, I cannot scheme and conspire behind someone's back while being sweet to them on their face. If I do not like somebody, I avoid that person but will never say something I do not mean. 4. I can cry easily. My eyes moisten up even at the stupidest sentimental dialogue of a dumb movie or (worse) a T.V. soap. I try to be discreet, though. 5. I once went to a professional studio and got my voice recorded for a folk song in a advert. It was along with one more female voice and a male lead singer. I don't even know if the ad and the song got released. That's my closest brush to stardom so far. 6. I once slapped a boy when I was around six or seven because he insisted that I was six years old dand not seven which I refused to acknowledge. Oh! the age of innocence (am not referring to the slapping bit, though). Let anyone tell me now that I am not in the age I am and I'll be walking on the clouds! 7. I have acquired an annoying habit of cleaning the surface of the gas stove even while cooking to ensure that nothing falls on its surface or if something spills, it is cleaned pronto. Yes, I am quite crazy. Phew! I was struggling to come up with more than five but really enjoyed doing it. Thanks again Aparna! errr..guys, plural..as in many guys at a time or several over the time..??? I meant don't go as far..
Firstly thanks a lot for nominating me!! Secondly, you are definitely not the last person on blogosphere to be nominated for this award.. :) And lastly, even i identify with some the facts you have mentioned(1, 3, 4 and 7(although i don't cook much) to be precise).So now I have to write a similar post, right??? Thanks again!! and really, so many points in common but now you've to come up with a different set of 7 facts, ok??? Thanks so much for the award..All is well-just caught up with some stuff.. will be back to the blogs soon..This tag has been pending for sometime now and I better take it up soon;-)..And.. 1,2,3,4 and 7 sounds so much like me ! And an ad, seriously? wow, thats awesome! Really? that many similarities?? Purva-janma sambandam poluruku..
oh, it didn't turn out to be such a big deal, after all, considering I never heard of the ad being featured or played anywhere anytime later..:-( but yes, a good experience counts..
hehehe..am also all excited for an award...and this being my first, you can well imagine! Oh, how did you find out? am a Virgo by the sunsign, moonsign as well as the ascendant..so there you go- a complete nut case of a Virgo at times! but for all the cleanliness propaganda that I am making here, this queer habit has gained momentum only post-marriage. I was not like this at all.. Ya, all the popular bloggers have already this badge shown across proudly..
LOL @ 7, refer to my reply to Sahana..even I would've been shocked if someone would've told me about this side to me before I got married..
Yeah! for the award. much detailed thanks will be up on the blog! and yes, I am doing the tag... sooner than I think possible. (fingers crossed) I need to show off my award, right? hey..that's great..yes yes, do show off the award! and hows motherhood treating you?? and yayayayay!!! for following me publicly..
now, I'll give you the "best follower" award!!! Wow Uma, loved reading those facts. Lizard phobia is a little like my mom, she'll insist on chasing them out of the house alive which has given me many funny memories :). 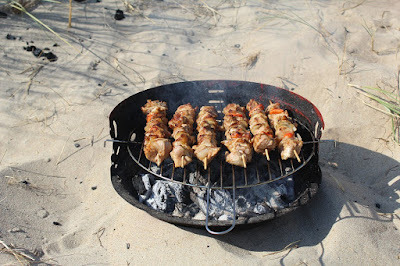 I usually just let them be unless I see them somewhere near my kitchen or vessels in which case i can equal my mom ;)!! So nice to hear about the recording, wish you would have known which one it was, I would have claimed having a famous friend ;)! No. 4, I'm just the same too - good to hear it happens to others too. Feels silly sometimes - my head will be going "Oh my God why am I tearing up?!" but my eyes seem to have some life of their own :). Don't ask why I am not writing, things seem to happen and I think oh I have to write about that, and then when i sit to write I'm completely blank :(. Aparna, I am taking it up soon, I promise !! Lizard phobia is quite common among the female clan, I guess. haha no.4 can be embarrassing. Miss u too..say hi to S.
heyy Tan, thanks a ton! loooong time..where had u been?? A novel after a loong time.